The State of Louisiana has changed their laws concerning golf carts. ALL New and Used Golf carts are now registered and titled vehicles with the Louisiana Office of Motor Vehicles. Affidavit of Physical Inspection for Vehicle Identity Verification by a Post Certified officer is required for registration of all Used Golf Carts. We take care of cart inspection and the trip to DMV. We are Lafayette's Area New Yamaha Golf Cart Outlet. We also have Quality Used Golf Carts in stock. We have standard or customized carts and a large selection of golf cart accessories. 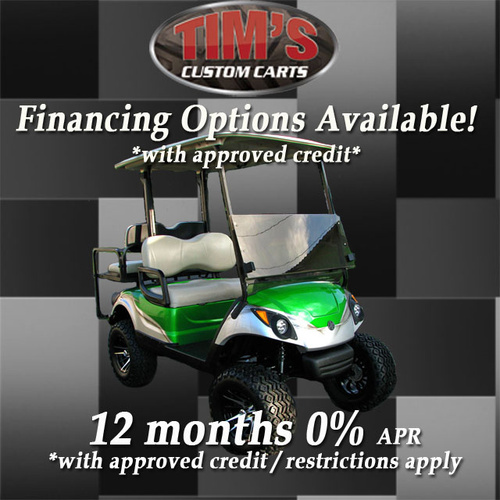 Visit Tim's Custom Carts in rain or shine, all of our carts are kept inside, protected from the elements. Check out the standard cart page to see the brand and year of carts in stock. Browse our customized cart page for our finished ready to go custom carts in stock. Stop by if you are wanting to accessorize, we keep a large selection of parts and golf cart accessories in stock. USED GOLF CARTS IN LAFAYETTE LA GOLF CARTS. USED GOLF CARTS IN LAFAYETTE LA GOLF CARTS. USED GOLF CARTS IN LAFAYETTE LA GOLF CARTS.